This was a first for me. We went to the Cameo Cinema in Edinburgh to see a live screening from the National Theatre in London – something I haven’t done before. I didn’t really know how a production devised primarily for theatre would translate without the extra energy that comes from live performance. I needn’t have worried. It was excellent. Somehow the whole production retained the feel of theatre even though it was being filmed, and translated the book into the theatre beautifully. Luke Treadway was an extremely compelling lead, and his autism was portrayed sympathetically and consistently. The rest of the cast supported his performance admirably. The translation from book to play is hard to describe. Narration from the book blended with live action, and occasional acknowledgements that this was a play. It worked really well for me however. My favourite part was after “the end” when Christopher comes back on stage to solve his favourite A-Level maths problem for the audience. The dark nature of much of the story emphasises the challenges that his autism causes for him, but this post-script this is a wonderfully joyful expression of things that make him happy, and that he is good at. Somehow it puts the rest of the story into context. I will certainly go to these screenings again if the opportunity arises – highly recommended! 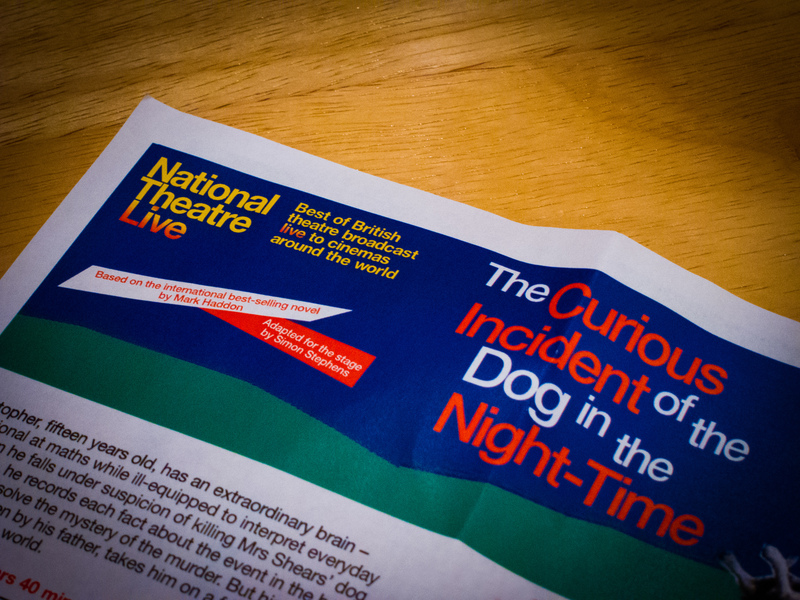 Th National Theatre’s live performance of The Curious Incident of the Dog in the Night Time was shown at the cinema. It is a book I like, and they did a faithful job of covering what is a very simple story told through quite a difficult narrative (the story is told from the perspective of an autistic teenager) and really capturing the complexity through sound and dance and digital projections. The guys playing Christopher (Luke Treadaway) and his dad (Paul Ritter) were particularly good, I really cared about the story by the end. It was extremely well shot, so you get to see quite a different perspective of a play – a sort of play/film hybrid. Maybe not as good as being there, but different in a good way. Worth the hassle!